Here it is! My ultimate Thanksgiving leftover remake. 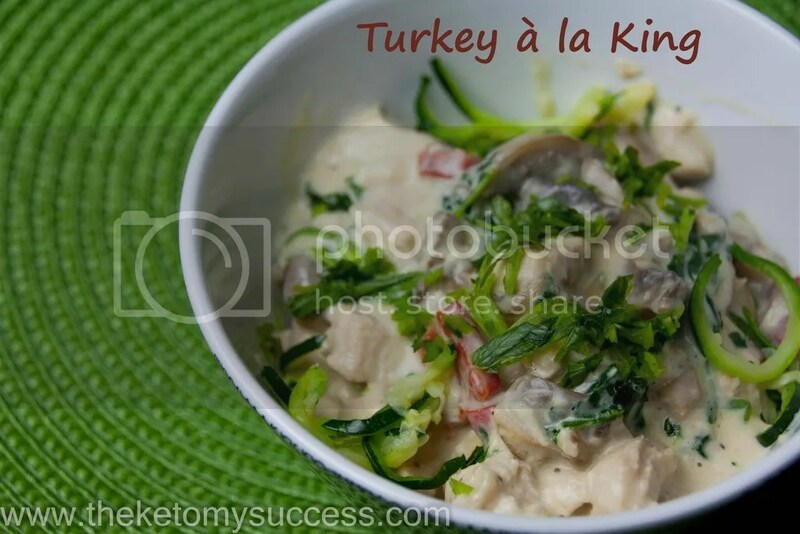 It’s namesake was the inspiration for this Chicken à la king remake. My mother-in-law suggested that we try and make chicken à la king last year after the holidays. I had never had or tried to make this dish so I did some research. To my dismay, the original recipe was laden with carbs. It had a flour based rue, peas, and pimentos. Did you know that pimentos carry a whopping 9 g carb/oz?! No thank you. So I took to reimagining and recreating this comfort food to fit into our Keto lifestyle. I replaced the peas, pimentos, and onions with keto-friendly veggies like spinach, mushrooms, and roasted red peppers. I replaced the flour based rue with a combination of my flavorful, homemade cream of mushroom and cream of chicken soups. Add in some delicious leftover turkey or chicken and you have a delicious Thanksgiving leftover renovation. After the holidays with heavy food, I like to serve this over zucchini noodles. For a heartier meal, you could serve this over cauliflower rice or faux egg noodles. I hope that you will give this a try! You will not be disappointed. Do you have any family favorite recipes that you would like to reimagine? Let me know! This low carb, gluten free Thanksgiving leftover recipe will leave everyone begging for more leftovers! A remake of a classic comfort food dish, packed with flavor and without all the carbs. Prepare the Cream of Mushroom Soup and Cream of Chicken Soup. In a medium pan over medium heat, melt the butter. Brown the mushrooms. Stir only occasionally in order to get the good golden color. Add cooked turkey and roasted red peppers. Add the cream of mushroom and cream of chicken soups and cook until warmed through.